You are here: Home / Landing / Growing a business is Not Easy ! Growing a business is Not Easy ! Any Business requires boosting sales but it is not only selling the product or service to existing and prospective customers. A business is successful only to follow a systematic and efficient way of gathering leads so that they can be converted to sales and ultimately loyal customers. 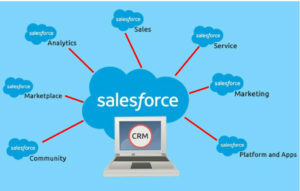 After extensive research and analysis of the various customer relationship management software’s, Salesforce is recommended as the best CRM software for businesses. Salesforce offers everything needed to create it faster and easier to close sales for a business. Salesforce is the world’s #1 customer relationship management (CRM) platform. Set up and manage our cloud-based CRM applications for sales, service, marketing and more without the aid of IT experts. Log in and start connecting to customers in a whole new way. Salesforce in Marketing Team of a company create and track various marketing campaigns to measure the success rate and automatically provide leads to the sales team of the company. Salesforce in Sales Team will get the lead information from their marketing teams and with this info usually, sales team will engage with the leads through calls and email. they will schedule the initial meeting with clients to know the client use cases and will take the discussion forward. Salesforce in Customer Support Team to track various customer issues and tracks them for resolution based on various escalation rules such as the importance of the client and elapsed time. This improves customer satisfaction levels as the issues do not fall through loopholes and are directly escalated to the next level. Salesforce in Management for visual dashboards and extensive reporting features, Salesforce provides the management of a company with visibility on what is happening in different teams. Salesforce in Training for users can easily find answers to their questions from the extensive online help manual and the video walk facility. Salesforce in Application Integration in other systems to extend its functionality through the Salesforce business app store – the AppExchange. DhruvSoft is one of the leading Salesforce Expert Partners servicing clients in USA, UK, Europe, Australia, and India. We have pioneered the Offshore Development on Force.com / Salesforce.com and have mastered the art of executing Salesforce.com projects based on Onshore / Offshore model.